Another taxi booking app called OIE has come into being. DrukSmart launched the app today. 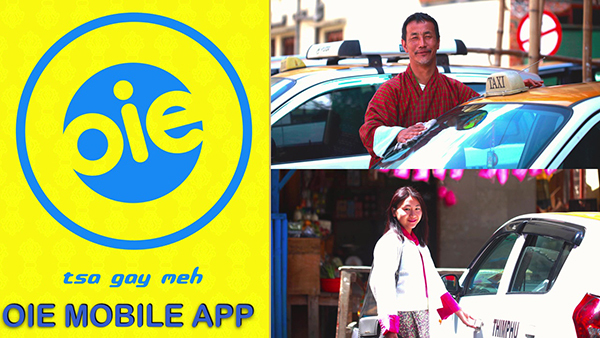 OIE is the second taxi booking app launched in the country. The first one- MyDrukRide- launched recently, is now a-month-and-half old in the business. The taxi booking apps are designed to take ‘convenience’ to a whole new level for both taxi drivers and customers. In fact, convenience and safety are the cornerstones of the taxi booking apps. As customers search for taxis using the apps, the drivers registered with the apps get notified immediately. The drivers can also easily trace locations of customers with the help of the apps. “The benefit of this online service is taxi drivers do not have to wander in search of passengers, and for the commuters as well, since they can book online, they do not have to wait long, looking for taxis,” Gyem Dorji, the Brand Ambassador of OIE said. OIE will cover only Thimphu and Paro to begin with. DrukSmart intends to extend the service to other parts of the country at a later time. “Safety for both drivers and passengers can be ensured through this online service as details will remain in the system,” Tshering Lhendup, a Taxi Driver registered with OIE, said. As of now, more than 600 taxi drivers have enrolled with OIE of which 92 have already registered. As for MyDrukRide, it boasts of 150 members and over 2,000 people have downloaded the app since its launch. “We have been in the market for one-and-a-half-month and the feedbacks are good,” Jigme T.Y. Rinzin, the Founder of Druk Ride said.